You mean Americans like OURSELVES. Im so tired of people saying how they are using our taxes, ruining our country. Its my taxes and my country too. I have said countless times that I support falling down on employers who are too cheap to pay fair wages. When people stop wanting to hire illegals, they will stop coming in large numbers. But what is a flood? I live in Southern California, and I can't even tell you where this flood of illegals are. I don't see them on the street begging for money. I don't see them looting all the stores. You don't really see them, because they are too busy working. And even if you see them, how do you know they are illegal? Make changes to curb illegal immigration, but forming vigilante groups and such to harass them isn't doing anything. If the ATM's broken, I'm not going to sit in front of it like an idiot on a lawnchair with an army helmet on chanting "USA! USA!" trying to catch everyone getting that money. Have someone fix it! Tell the bank to take care of it. But we're not at that point where illegal immigration is destroying our country. Take measures to prevent that from ever happening, but don't freak out like its going on right now! Do you not have a roof over your head? Is your life really that bad? 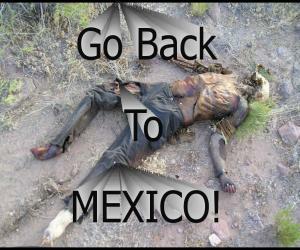 I dont understand the incredible anger people feel towards illegal immigrants. It's not even affecting you. At least not more than its affecting me. Its hysteria. You don’t see a problem, because you identify with those creating the problem. If you don’t think illegal immigration has depressed wages, closed hospitals, over-crowed and lowered the standards of schools, strained our prison systems, closed “legitimate” businesses, destroyed neighborhoods, and if not curtailed -- will send our nation into a third-world abyss; then, you really have been blinded by your ethnic loyalty. I’m black, but that doesn’t prevent me from acknowledging problems with black criminality in this country. Your views are very narrow-minded and selfish. Why on Earth are you a moderator of this site? Be very careful there--------'calling out' a Moderator on the open form is a ToS violation and can cost you your ability to post here. I may be 'White'; but, I have no problem with the authorities playing 'hard ball' with Meth heads, skin heads, etc. despite most of them being of my race. Those are some beautiful pics! I know there are some very nice places in Mexico. How many people go on vacations there every year because it's so nice? Just like everywhere there are nice places and there are bad places. Looking at those pictures though you'd think the people would want to stay, it's beautiful! I love how towards the end there is a picture of the Home Depot out there. AMC, my dad is a OTR truck driver and he is sent to LA a lot, in fact he was just there this week and he sees it. He has to talk to them, drive with them and deal with their ignorant attitudes so I don't know why you can't see it. My dad doesn't even live down there, he is there for maybe 2 days out of the week and he can identify that there is a serious problem there. In fact, he dreads going down there because of what he has to put up with. And you mentioned in the past you yourself are Latina as well so no Hispanic can dare call you a Mexican hater without him/her looking really silly. Last edited by ArizonaBear; 07-07-2008 at 09:22 AM..
A flood is 30 million people (or more) with no legal right to be here taking jobs, depressing wages, overcrowding schools, hospitals and prisons, sucking at the welfare teat, demanding citizens rights to which they are not entitled and claiming the US Southwest as some sort of ancestral 'homeland'. You say you don't see them, but I see them ALL the time. They're found in almost EVERY restaurant and on EVERY jobsite in America. Yeah, they're working, but they're doing it for wages that Americans can't afford to take because we don't live 20 people in a house and get FREE medical care. America's largest Neighborhood Watch group is tired of law enforcement not being allowed to do their duty, and has stepped up to the plate to do that job until such a time as American politicians get their heads out of their corporate sponsors a$$e$ long enough to rescind things like Special Order 40. You call it harassment, I call it a job well done. You say don't freak out because illegal immigration is not destroying our nation RIGHT NOW, but I'm reminded of the lesson taught in the Old Testament by Noah. He worked on that ark for 40 years before the rains started. There were times I went hungry, times the sky was my roof, and times that my life really was THAT bad. Are you suggesting those times must become permanent before I'm allowed to do something about the problem? You don't understand because you have no empathy for those of us who've been adversely affected by the problem. Construction was a solid way to live a middle-class life and be able to put your kids through college back in the 60's. That's when I embarked upon that career. I've watched my wages fall by 50% and my opportunity for a middle-class lifestyle disappear because of massive illegal immigration. That's not hysteria, that's FACT! If you put yourself in MY shoes you'll KNOW why I'm PISSED!!! Excellent post! Sorry I can't rep you. A lesser known piece of news, but one I find more "despicable" is one about anonymous vandals draining water tanks intended for illegal immigrants crossing through the harsh Arizona desert. A lot of these immigrants are people who don't really know what to expect when they are crossing and sometimes get lost in the desert. Many many have died out there of dehydration or hypothermia(sp?). Well, some people out there hate illegals enough that they think they deserve the worst kind of death. Its not my fault they are that stupid that they cross the Arizona desert in August. It's your right to feel that way..just as it's their right to feel like "It's not MY fault the gringos are so stupid they can't even monitor their own borders....how can ANYONE respect a country with such 'easy' borders?". I expect a thread to pop up stating "Anti Immigrants want to torture kittens"
If someone like myself is part Italian, part Irish, what am I Italian, or Irish. Keep in mind I have red hair and blue eyes. So if AnnaGrrrrrl is only part Latina, and probably majority Anglo, why does that automatically make her a Latina. Isnt that kind of waspish.